Sea Gate, Zendikar's foremost city, has fallen to the Eldrazi, and Gideon holds himself partially responsible for its fall. He left the fight briefly to go to Ravnica and collect Jace Beleren, hoping the mind mage would be able to solve the puzzle of the hedrons and help to turn the tide. 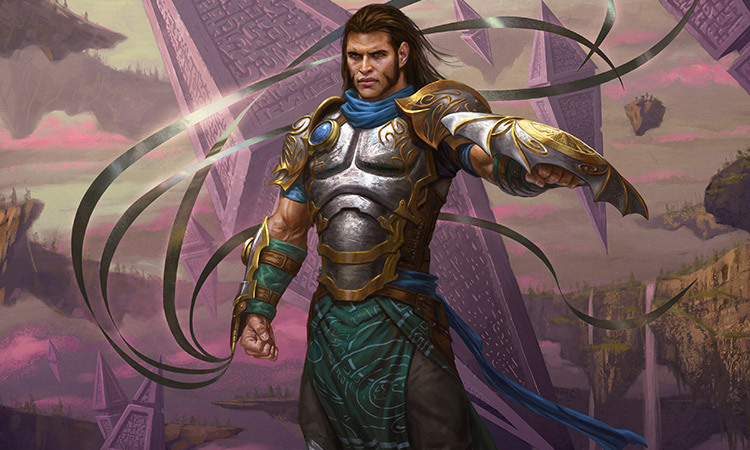 When Gideon and Jace returned to Zendikar, Sea Gate was beyond saving. Gideon helped an injured Commander Vorik evacuate, along with a small band of survivors—all that remained of Zendikar's greatest city. 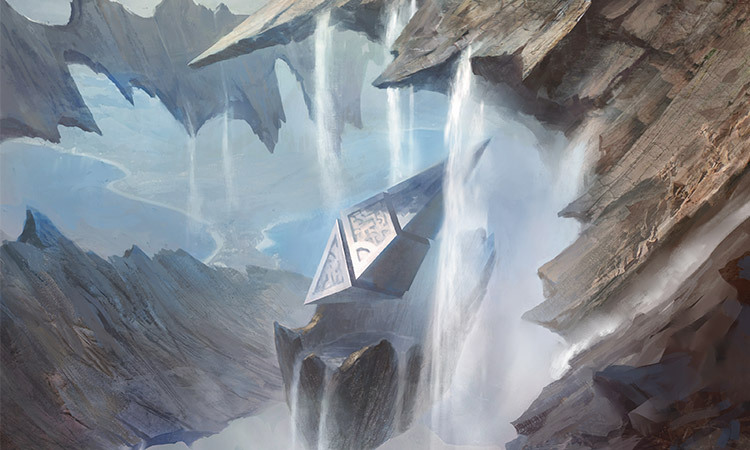 The group made camp atop a massive, high-floating hedron, and soon after, Jace left with the merfolk Jori En on a journey to the Eye of Ugin to look for more clues about the power of the hedrons. Jace tried to persuade Gideon to accompany him, but Gideon refused to leave the Zendikari for a second time. Their survival is the most important thing to him now—though he does not know how he will ensure it. We must collect our strength. Commander-General Vorik's orders. The directives Gideon had sworn to serve. Of those, survival was the most daunting. 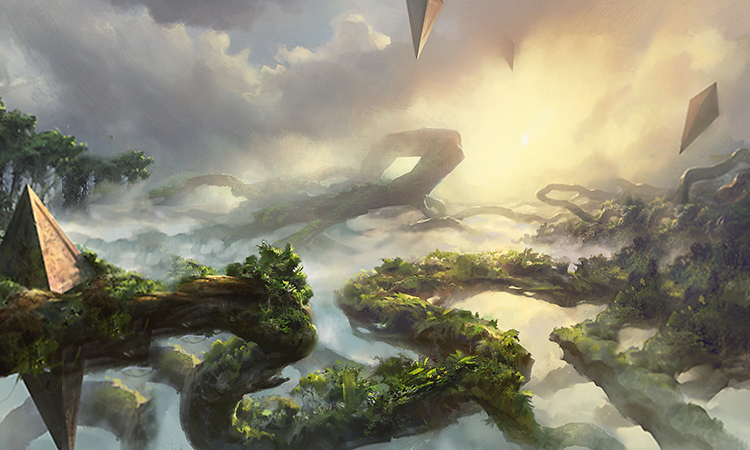 Survival had never been straightforward on Zendikar, but recently it had become all the more elusive. Survival on this plane, in this time, in the face of these monsters, demanded patrols, fortifications, weapons, healing balms, food, water, shelter, warmth. The list went on. So Gideon was taking it one step at a time. Right now, it was the water that he was working on. With help from the kor Abeena, he was in the process of repositioning the nearest floating rock waterfall so that its precious stream of life-giving water would rain down onto the far end of the hedron camp where the survivors could safely and easily access it. "All clear!" Gideon called to Abeena. Abeena was balancing on the thin lip of the waterfall rock, which was currently too far away and turned in the wrong direction, pouring buckets of water down into an expansive canyon where it couldn't be reached or collected. 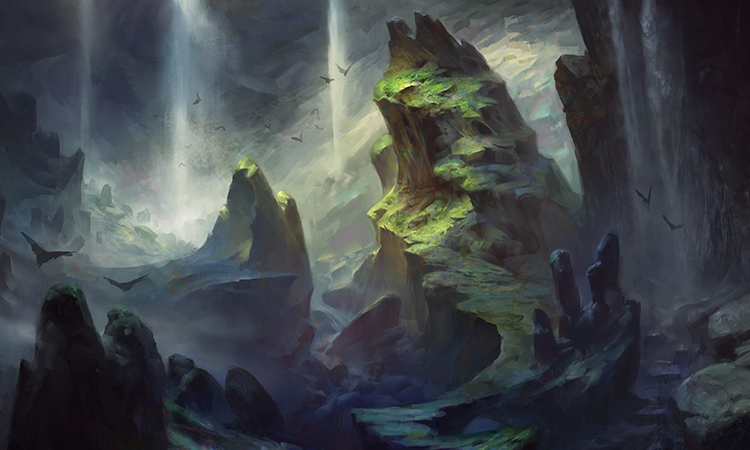 The kor had secured four ropes that trailed from the waterfall to the main, massive hedron camp. Gideon held two of the ropes, one in each hand. To his right, a merfolk and another kor braced themselves, cinching the third rope. And to his left, three humans clutched the fourth rope. "Ready when you are!" Abeena called back. Gideon nodded to the others. "All right, here we go. Heave!" He hefted the ropes, walking backward, planting one foot behind him and then the other. The others pulled too, and together they lugged the waterfall closer to Sky Rock. "That's it," Gideon encouraged. "Almost there." Sweat formed at his temples as he gave the great stone another yank. The feeling of exertion was one of the most satisfying he knew. And the rush of a crisp Zendikari breeze past his ears wasn't bad either. His appreciation for this world had grown immeasurably in just the short time he had spent atop Sky Rock. The view from up here was unmatched. In another life, Gideon could have seen himself living here, spending his days climbing, hunting, exploring, and adventuring. It was easy to see why so many loved this world. Why so many fought for it. "Hold it there!" Abeena called. "I'm going to turn it around." "Brace!" Gideon ordered. He tapped into his reserves of power and grounded himself to the hedron; he became as immovable as the thickest of Zendikar's trees. The others tightened their grips and steeled themselves as Abeena flung another rope with a thick hook out to a third floating rock. With a wide stance, Abeena pulled on that rope, using it as an anchor to turn the waterfall around on its axis. She aligned the floating falls so that the stream of water faced the camp. "I think I've got it!" A cheer rose up from behind, and Gideon turned to see that most every survivor at Sky Rock who was free and able had gathered around to watch. Their longing was palpable; they were anticipating that first quenching swallow of water. "We have some thirsty people over here, Abeena," Gideon said. "Let's bring them some water!" "With pleasure." Abeena detached the fifth rope and knelt low on the hedron so she could guide its path. "Bring it in." "This is going to shake us," Gideon warned the gathered crowd. "Hold on!" A final yank heaved the waterfall straight over Sky Rock. The water pounded down on the far end of the hedron; the entire rock shifted at the weight of the turbulent stream. But both the din and the vibrations were drowned out as the Zendikari raced to splash under the stream, cheering, drinking, singing. "Thank you, Gideon." Abeena said as she climbed down from the rock. "We're lucky to have you here." "It's you we're lucky for," Gideon said. "Nice work with the ropes. I think you earned this." He handed her a cup. "Cheers." She raised the cup and strode toward the stream. Good. This was good, Gideon thought. They had water now. They needed water to survive. That meant they were one step closer. "He doesn't want you wasting your time with this." Tazri's voice sounded from behind. She must have come from Vorik's tent; that's where she had been spending most of her time, talking and planning with the commander as three healers watched over him. The purpose of Tazri's vigilance was obvious to Gideon. If the persistent coughing that he heard from the commander meant what Gideon feared—Eldrazi corruption—then soon enough Tazri, Vorik's most trusted advisor, would take the commander's place. That would mean a lot of changes for the survivors of Sky Rock. And for Gideon. Tazri had been cold toward him ever since Vorik had taken Gideon's suggestion over hers during their evacuation. It had been Gideon's idea for the survivors to retreat up to the top of the floating hedron; Tazri had wanted them to push on and evacuate further. Gideon still believed his had been the correct course of action, but he no longer wanted to argue with Tazri—he needed to earn her trust. "Tazri." Gideon turned, making sure to keep smiling. "I have an extra cup. Do you want some fresh water?" "Their time would have been put to better use preparing to continue the evacuation." "They are preparing," Gideon said. "This will help. It'll be easier to fill their canteens." "They were fine filling them down at the river. You used, what? Six healthy, strong people who could have been out there hunting. They might have felled a baloth, or even two by now. We need to collect rations. Commander Vorik's orders." "Not to splash around and play in." Tazri waved at the Zendikari who were still dancing in the stream. "This is a waste of time." Gideon couldn't help but grin at the sight. "Keeping spirits high is never a waste of time." "I know what you're doing." Tazri narrowed her eyes. The glow of the halo she wore around her neck seemed to intensify. "You're trying to make this place comfortable. Trying to find excuses to stay. You're waiting for him to come back. That other stranger. The one who is like you." Jace. She was talking about Jace. This was not the first time Tazri had hinted that she knew Gideon was a Planeswalker. "I heard you arguing with him," Tazri went on. "And I heard you lose." Gideon bristled. He hadn't lost. He wanted Jace to solve the puzzle of the hedrons; he might have preferred that Jace had waited to go to the Eye of Ugin until things were more stable here, but he had agreed with the general plan. "You can't make these people wait here for him to get back," Tazri said. "It's too dangerous. Do you have any idea how long he'll be gone? Do you know how far away Akoum is?" Gideon did, but she didn't give him the chance to answer. "No, you don't," Tazri accused. "You're not from here. I know about you, about him. Neither of you belongs on Zendikar, and you have no right to come here and put these people—my people—in danger." By the time she finished she was leaning in, her finger stabbing the armor on his chest. Gideon held up his hands. He wouldn't lie to her; that wasn't the way to establish trust. "You're right. I'm not from this world." He took a step back, giving Tazri some space. This was his chance to explain; he needed her to understand. "But I do know Zendikar. I know it well. I have crossed its seas and climbed its mountains. I have seen its sun rise and set countless times. I have traveled to and battled on nearly every continent. And I will continue to fight." He met and held her gaze. "I care greatly for this land, and even more for its people. I am here only to help." Tazri surveyed him, as though taking him in for the first time, really looking. Gideon stood tall, his expression earnest, willing her to see how much he meant each word. She inhaled sharply. "Then you'll stop interfering. Vorik knows what's best. I know what's best. And it's not that." Tazri waved in the direction of the waterfall. "That's bad, Gideon. Don't you see? It gives the people a false sense of security. It makes them think that they can call this place home when they can't. They're not safe here. At any moment the swarms from Sea Gate might descend on us. At any moment we might be forced to fight for our lives again. So few survived the first time. How many do you think will survive a second assault?" "If you want what is best for these people, as you say you do, then help them hunt. Help them collect rations. Help them prepare to continue the evacuation. That's their only chance of survival." A coughing fit from the direction of Vorik's tent drew both their attention. "It's what Vorik wants." Tazri turned swiftly on her heel and strode toward the tent. Gideon paced at the far north end of Sky Rock, the din of the waterfall barely audible in the distance. He was waiting for the rest of his hunting party; the same six who had helped him pull in the waterfall would now help him track a gnarlid—or a baloth, if they were lucky. And Tazri was wrong about the waterfall. Survival was the directive, and Gideon had acted accordingly. The water would help the Zendikari survive, whether it was for one more night, one more week, or one more month. He disagreed with Tazri, and with Commander Vorik for that matter. He thought they should stay. Not only because of Jace, though Tazri wasn't wrong that Gideon wanted to wait for Jace's return. The mind mage wouldn't be gone as long as Tazri thought; it would be a long journey to Akoum, undoubtedly, but Jace would most likely planeswalk back to the camp after he found what he needed at the Eye. That would cut the total distance, and time, in half. And with the information Jace found, Gideon hoped their chances of survival would soar. The promise of the hedrons' power was the hope he clung to. If the Zendikari could wield that power, perhaps they would actually survive the evacuation that Vorik and Tazri wanted them to make. Gideon couldn't protect them out there in the wilderness the same way he could here on the hedron. At least here they were all in one place, and he knew where they were. At least here they had access to food, they were building shelters—and they had water. If the goal was to survive, Gideon didn't think they should leave. So how long could they stay? He looked north, in the direction of Sea Gate. Just the top of its lighthouse was visible from here. What were the Eldrazi doing? Were they still clambering over its walls and spreading their corruption across the rocks? Or were they on the move, as Tazri suggested? How fast did they travel? How long would it take them to reach this floating hedron? How many could Gideon hold off? If they came at a slow enough trickle, he could dispatch them one by one before they reached the encampment. He could do it alone. No one else need risk their life. He would fight the whole blasted lot of them one by one if he had to. But if they came in a group . . . "Hurry up, Jace," Gideon breathed. "Gideon!" The voice came from above, startling Gideon—for just a heartbeat he thought, hoped, prayed it was Jace. But it was far too soon. Of course it wasn't Jace. Gideon took a step back as an enormous blue and white manta descended from above and hovered an arm's length in front of him. The elf on its back looked slightly out of place, but not uncomfortable. She knelt tall, her back straight. Her arm was raised, holding a spear. "Seble," Gideon said. "What is it?" 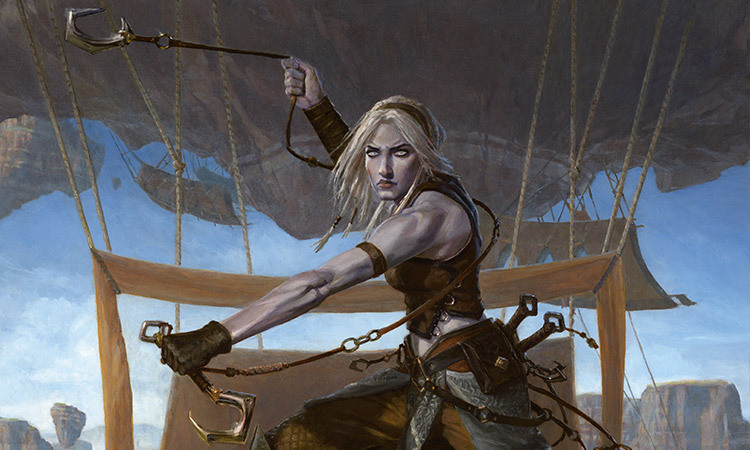 Gideon didn't question the skyrider; she was the camp's only patrol stationed in the air, and she had been the alarm system that had saved them from a potential Eldrazi attack more than a handful of times already. "There's a party coming in from the south," Seble called back over her shoulder as the manta shot into the sky. "And they're being tailed by an Eldrazi." Gideon exhaled a relieved breath. If they were coming from the south, then whatever Eldrazi was tailing them wasn't part of the swarm from Sea Gate. There was still time. "It's a flier," Seble said. "And it's big, Gideon." Gideon refocused. Even if it wasn't the swarm, it was still an Eldrazi, one he would have to destroy. "Take me there." He gripped the back of Seble's belt as the manta surged forward. "I think they're more refugees," the elf called back to him. "They looked pretty beaten up, from what I saw." "Then let's make sure the last leg of their journey is as pleasant as it can be," Gideon said. This would be the second group of refugees Sky Rock had welcomed in that many days. The last party of refugees was a group of kor who had been found by a hunting party, wandering around in shock after having seen Sea Gate. They had come from Akoum; they had traveled across two continents and the sea, all because Sea Gate was supposed to be a sanctuary. That was the word that had spread across most of the world, according to the kor. They promised that there were more coming, from all over. And here was more proof. All of these Zendikari were fleeing to a sanctuary that did not exist. As the manta circled under a large, broken hedron, Gideon caught his first glimpse of the giant Eldrazi Seble had warned him of. It was a low flier, with strikingly blue tentacles, and it was undulating along just above the treetops, winding its way between the vines that dangled down from the hedrons above. Its course was set on a party in the distance, just as Seble had said. They didn't seem to be aware of the danger they were in. "How close can you get me?" Gideon called up to Seble. "How close do you want to be?" Seble kicked the manta's side, spurring it into a dive, angling straight for the Eldrazi. As the manta swooped, Gideon unfurled his sural. Seble's pass brought them close enough for her to reach it with a solid thrust of her spear. As the point of her spear punctured the Eldrazi's side, the four blades of Gideon's sural slashed its back, slicing it open in four places. But that was not enough damage to slow it down. "Incoming!" a panicked voice called out from below. It was one of the refugees—a human woman with long silver-gray hair. She had seen the Eldrazi. The woman's agitation seemed to attract the monstrosity. It picked up its pace. The refugees broke into a run. "Another pass," Gideon called to Seble. "Hurry!" On her second pass, Seble flew even closer than the first time. So close that Gideon could smell the Eldrazi's freshly-exposed innards. He lashed out ahead with his sural and gore splattered out of four more slices on its side. But the injuries weren't slowing it down. He had to slow it down. He whipped his sural again, this time with the intention of ensnaring rather than slicing. With a flick of his wrist, the blades of his weapon coiled around the Eldrazi's tentacles. Gideon yanked, pulling the Eldrazi backwards and off course, away from the refugees. But he hadn't considered the physics of a sky battle. Without anything to counter the force of his assault, Gideon, Seble, and the manta were whipped through the air in the opposite direction. They dipped and faltered, Seble scrambling to regain control. "Let it go!" she called back to Gideon. 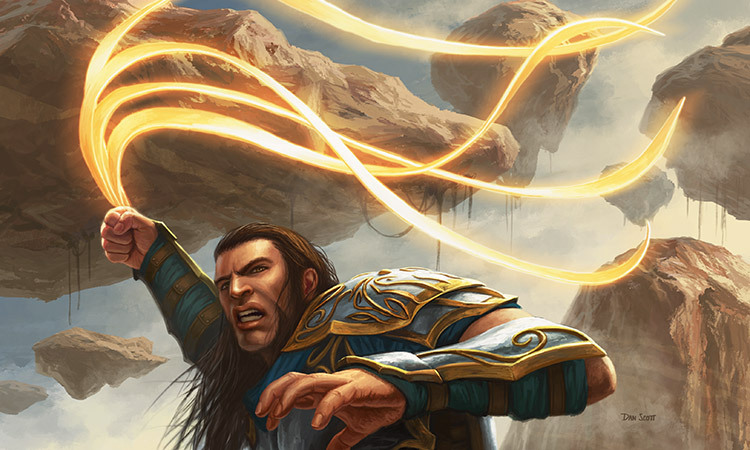 Gideon flicked his sural, attempting to release the Eldrazi, but two of the blades of his weapon were tangled around the tentacle, caught; he couldn't pull it free. The Eldrazi bucked and the manta was jerked to the side. "Let go!" Seble called again. Gideon realized she meant for him to let go of the sural—but too late. He lost his seat and slid off the manta's curved back. For a moment he plummeted through the sky. Then his sural jerked him to a sudden halting stop, and he was left swinging from the Eldrazi's backside—he watched Seble and the manta plunge toward the ground. The whole ordeal hadn't won him any time. The Eldrazi was still on course. Dangling from it, Gideon could make out the scars and wounds on the refugees' arms and legs. "Stay away from them!" Using his sural like a winch, the way he had seen Abeena do, Gideon pulled himself up the Eldrazi's tentacles and onto the bony plates of its back. The beastly thing thrashed and twisted, reaching for him with four arms that bent unnaturally backward, and still somehow maintaining its heading. 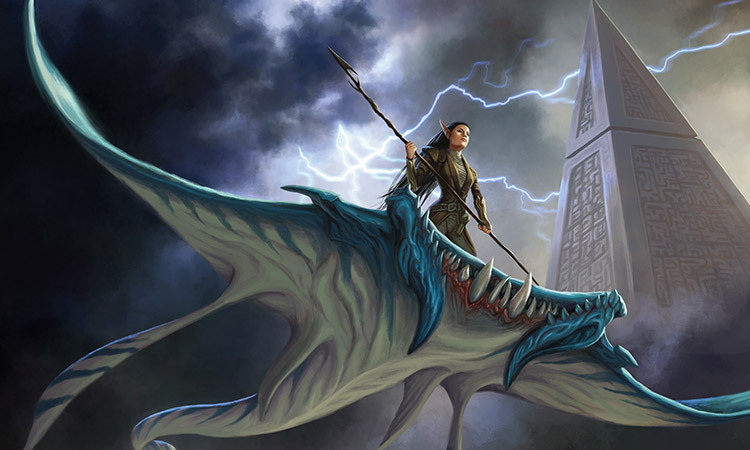 Gideon channeled the magic of his protective, glowing shields, putting one up first on his side, then his front, and then his leg, blocking all of its appendages as he climbed up the bony plates toward the Eldrazi's head. He grabbed hold of its thinner head tentacles that looked vaguely like antennae, and using them like reins, he snapped the monster's head back. Then he thrust it forward, putting all of his weight into it and forcing the Eldrazi into a nosedive. The thing reared and spasmed, flinging its tentacles about, but Gideon didn't let up. "I told you to stay away!" With a final thrust of power, he drove the Eldrazi straight into the ground, putting his whirling shields of magic up just in time to protect himself from the impact. The crash dislodged his sural and Gideon snapped it back, winding it up. He jumped off the Eldrazi, and with his next breath he lashed out at the monstrosity, once, twice, again. Slicing off tentacle after tentacle, ripping into the tenderest parts of its flesh. The thing chattered and squealed; the unnatural noises only spurred Gideon on. He would slash the Eldrazi once for every Zendikari that had been lost to its kind. And once more for those who soon would be lost. All the people were doing was trying to survive, but there were too many of the monsters—too many that would come endlessly, spreading across the land. Forever. It would never end. The Zendikari would never be safe. How would they ever survive? 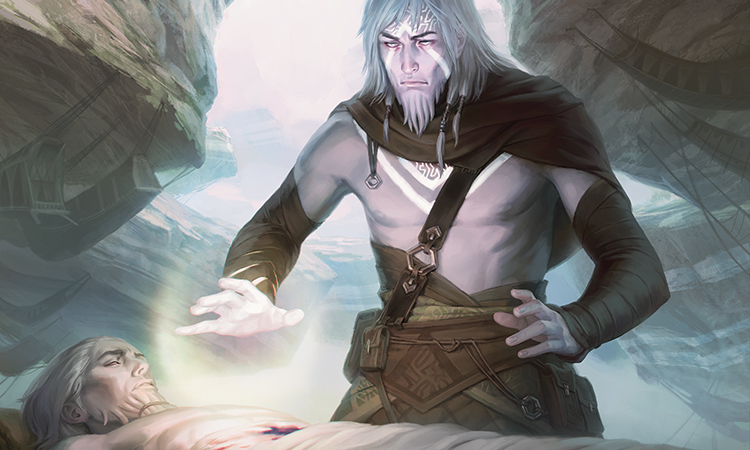 A pile of Eldrazi gore and strips of flesh lay at Gideon's feet. There was nothing left to destroy. He dropped his arm and his sural fell motionless at his side. They couldn't retreat to Zulaport. No matter what Vorik said. No matter what Tazri wanted. The people of Sky Rock would never survive this. They would never make it across Tazeem, let alone across the sea. There were too many Eldrazi. They had to stay. If they wanted to survive, they had to stay here. But what if they wanted to do more than survive? A gust of wind and the beating of leathery wings drew Gideon's attention. He turned to see Seble hovering not far above, looking on, question in her eyes. "Did they make it to camp?" he asked. She directed the manta lower so Gideon could climb on. Before Gideon stepped off the manta's back, he could hear Tazri's raised voice. She was arguing with the new group of refugees. Gideon jogged over. "Sea Gate can't fall," a kor in the party grunted as though the idea was absurd. "It has," Tazri said. "We evacuated a few days ago. It is lost." "No." The old woman with long silver-gray hair, who Gideon had seen from above, gripped Tazri's arm. "No." She shook her head. "This." She held up her other hand and lifted one bony, wrinkled finger. "This is what we fought for. This is why—" she bit her knuckle to fight back a sob. "You have no idea." Her voice shook but she didn't cry. "Do you know how far we have come? The Roil, four times. That monstrous Eldrazi. The swarm of them in the river. Tho, Zuri, Daye, Itri—they all fell knowing that we would find—no. This is why we came." She brandished her finger in Tazri's face. "This is Sea Gate. Sea Gate is Zendikar's only hope. Sea Gate is all we have left. We came for Sea Gate." The others behind her held up their fingers too. Gideon recognized the gesture. The first band of refugees had made the same display. Their fingers were a sign for the lighthouse. Sea Gate. Their hope. "I'm sorry," Tazri said. "Sea Gate is gone. You can come with us to Ondu." "Ondu!" A young woman in the group balked. "There's hardly anything left of Ondu." "Everyone from Ondu is going to Sea Gate. So is everyone from Akoum. Even some of the vampires from Guul Draz. And now you're telling us, all of us—after all that we lost, after all that we fought—that there is nothing? There is no end?" She looked from Tazri to Gideon. "This can't be true. Please. This can't be true." Silent tears streamed down her cheeks. "It's the commander." Abeena's voice cut in, clipped and rushed from behind. Gideon turned. "He called for you." She was looking at Tazri. "I'm sorry," Tazri said to the refugees. She was already running for Vorik's tent. "I have to go." "Both of you," Abeena said. "Gideon, he wants you too. Now." Gideon could see it in her eyes. Vorik would not live to see the sun again. "Stay with them, Abeena," Gideon said. Gideon left the small group of refugees and raced across the hedron behind Tazri. She looked back at him. "There are no new rations," she spat. "You didn't go hunting." "No." Gideon caught up with her and held open the flap of Vorik's tent. "I didn't have the chance." Now was not the time for Vorik to die. Gideon was not ready to answer to Tazri. Inside the commander's tent it was stuffy and smelled of dry, rotten fungus—the smell of Eldrazi corruption. It came from Vorik's breath. Three healers stood back against the far wall, silently vigilant. Gideon knelt at the commander's bedside and Tazri stood behind. "Sir, we're here," she said. Vorik opened his eyes; they were bloodshot and had the look of cracked glass. "I hear there are new arrivals." "Yes," Tazri said. "It's a small party." "Refugees. And there are more coming every day," Gideon said. "They were going to Sea Gate." Vorik shook his head, regretfully. "Sea Gate." His voice was little more than a whisper. Tazri glared at Gideon, a look that told him to stop talking, but he felt the urgent need to speak up. Vorik had to know the truth—now, before he passed. Now, while he could still decide the fate of the people here. "They're coming from all across the world, sir. From all the other places that are falling to the Eldrazi, Akoum, Guul Draz . . . and Ondu." "Sea Gate should never have fallen." Vorik was still shaking his head, lost in thought. He didn't seem to have heard Gideon. He looked to Tazri. "And how are the preparations for the evacuation?" "We're on track, sir." Tazri said. "The new numbers mean we'll need to collect a few more rations. But we can leave within the week if everyone does their part." She shot another glare at Gideon. "I have mapped a route across Tazeem and—"
"A route that will be rife with Eldrazi," Gideon cut in. "The safest route we could find," Tazri countered. "There is no safe route across Tazeem," Gideon raised his voice over Tazri's protest; he had a point to make and he would make it. "There is no safe route on all of Zendikar." "Our journey will be dangerous, yes," Tazri said. "But we knew that. And I have been assured by our scouts that once we make it to the coast there will be boats waiting to take us across the sea." "Boats that have just made land," Gideon said. "Boats that carried refugees away from places like Akoum and Ondu. Because those places have fallen." Tazri's nostrils flared and the halo around her neck blazed. She turned on Gideon. "I hear you! We all hear you! You don't want us to evacuate. You don't want us to go to Zulaport." "No. I don't," Gideon said. "So what would you have us do instead? Stay here? Sit here on this rock vulnerable and exposed, and wait for them to come for us? Wait to die?" "No." Gideon realized that he did in fact have another plan. Sometime between slaughtering the flying Eldrazi, talking to the refugees, and seeing the cracks in Vorik's eyes, he had worked out what had to be done. He looked to the commander, meeting Vorik's fading gaze. "I would have us go back to Sea Gate." "Sea Gate has fallen, Gideon." Vorik coughed, a cloud of dust rising up out of his mouth and floating in the air between them. "It's overrun. It's lost." Part of Gideon wanted to look away from the dust, from the dying commander, but he respected and cared for the man too much; he didn't so much as blink. "It can stand again, sir," he said. "We can take it back. We gather an army here at Sky Rock—we're already halfway there with all the refugees that are pouring in. Once we have enough soldiers, we surround it just like they did, and we move back in and reclaim what is ours. 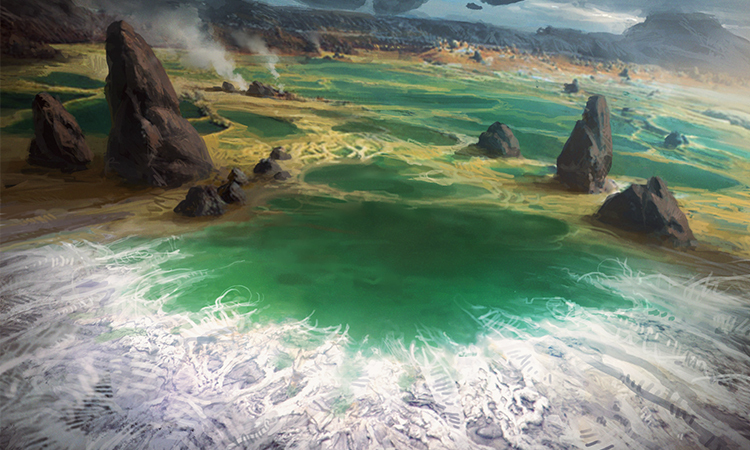 You yourself have said that it's the most strategic location on all of Zendikar. We need Sea Gate, sir, we need it to—"
"You're insane," Tazri cut him off. "You were there, Gideon—for most of the battle at least. You saw our people fall. You saw the swarms of Eldrazi. How can you possibly think we stand a chance?" "The Eldrazi won't stay there for long," Gideon said. "Eldrazi don't operate like the sentient armies we know. They have no interest in keeping Sea Gate. They feed on what they can and then they'll pass through, just like they pass through any other place." "They'll pass through and come straight for us!" Tazri said. "We can't leave soon enough." "There is nowhere left to go, Tazri!" Gideon clenched his fists. Why couldn't she see? "You keep saying that we have to 'evacuate,' but there's nowhere to evacuate to." "Zulaport," Tazri said. "We're going to Zulaport, commander's orders." "And what's to say that Zulaport won't be gone too once we get there? What's to say it's not gone now? This is the end. The Eldrazi are taking over everything. 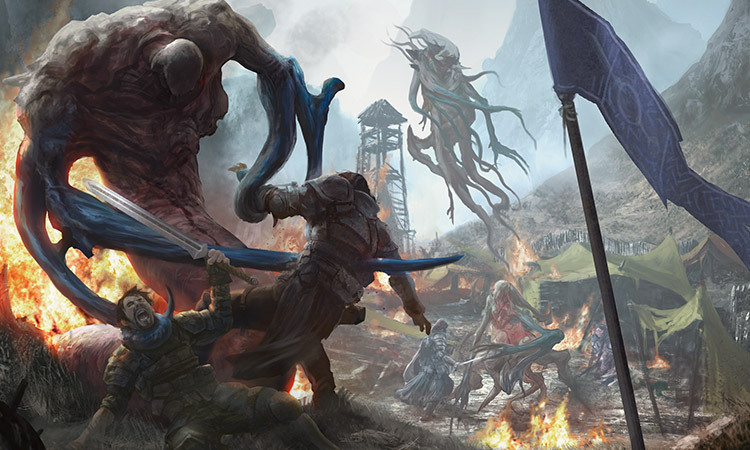 If we don't make a stand now, all of Zendikar will be destroyed." "Enough!" Vorik shouted, and with his shout came a coughing fit. Clouds of dust shot up into the air with each hack. The three healers pushed past Gideon and Tazri. Gideon stood, taking a step back away from the commander's bedside. "Fool," Tazri spat. "You're a fool. You would march these people, my people, Vorik's people, to their deaths." "No, I would give them a chance to live." "Their chance for survival is at Zulaport. You know that as well as I do." "Survival is no longer enough, Tazri," Gideon said. "How can you say that? Survival is the only thing." "I didn't see it either. Not until just now. I've been so focused on what's in front of us. We all have. But we have to look at the bigger picture." Gideon recognized Jace's words on his lips. In this case the mind mage had been right. "It's not just Sea Gate that has been overrun. The swarms of Eldrazi are taking everything. They're everywhere. I've seen them myself. If we don't act now, if we don't fight back, then this world will be lost. Everything and everyone on it will be destroyed." Tazri's bright eyes pierced Gideon. "Except for you. You will just leave." Gideon blinked, taken aback by her accusation, but before he could counter, Vorik's voice rang out. "Stand down!" For a moment it sounded like the commander's strength had been restored, like he was shouting orders on the battlefield. "Stop clamoring around me and step back, already. Give an old, dying man a chance to breathe." He was talking to the healers. "Your work here is done." He nodded at them, his look firm. "Thank you for all you have done, but it is over." He looked past the healers. "Tazri, Gideon. Come. Time is short." As the healers somberly stepped back, Gideon and Tazri approached. "I am dying, and you are arguing." "Sir—" Tazri started, but Vorik spoke over her. "Now is not the time for arguing. Now is the time to listen. Listen to each other. You're each other's most valuable assets." Gideon glanced at Tazri, but she continued to stare down at Vorik, stone-faced. "If you will not listen to each other, then at least listen to me." Vorik propped himself up ever so slightly. "There is something important I must tell you." He licked his dry lips, but his tongue was even drier. Flakes fell from both. He cleared his throat. "When I was cornered out on the battlefield, when that Eldrazi monstrosity pierced me with its corrupted essence, it was the most terrible thing that I had ever experienced." "But in that moment, it wasn't terror I felt. Not even regret. No. What I felt was relief. I am ashamed to say it, but it is true. I felt relief that I would get to take the easy way out; that I wouldn't have to stay and face what came next." "But then I thought of my people," Vorik said. "I thought of all the Zendikari, and I felt remorse. I would be gone and they would be here, you would be here, you would have to watch the world end." Vorik paused, swallowing a cough. "But now I have hope," his voice was choked. "I have hope that that is not true. I have hope that there is still a chance for Zendikar. Gideon Jura, you have given me hope." He held up a finger. "Sea Gate," Vorik said, holding his finger high. Then he turned it to point to Gideon. "These people need to be inspired the same way you have inspired me. They need to find hope, just as I have. They need a leader who sees the way to victory no matter the circumstances. When I am gone, you will lead these people. You will reclaim Sea Gate, Commander-General Jura." "Sir." Gideon staggered. The title. . . "Tazri." Vorik looked to his advisor. "You are strong and brave, and you have been my most loyal advisor. But you are too close. You are too close to me, to my ideas, to Zendikar. This world needs a fresh perspective, these people need a new reason to believe." "You know Zendikar better than anyone—better perhaps than I do. That is why the commander will need your help. You will stand by him as you have stood by me." "You can't do this, sir," Tazri said. "He's not even a Zendikari." Vorik coughed again. A hard, racking cough that brought up a chunk of corruption as large as a coin. He fought for breath, shaking his head. "It doesn't matter where he came from, Tazri. He has a Zendikari's stubborn spirit." Vorik reached out to Gideon. Gideon closed his thick fingers around the commander's wilting hand. "Don't lose that spirit," Vorik said. "Don't lose this land." "I will not, sir," Gideon vowed. "I leave Zendikar to you, Gideon." The words came out on a cough that tore through the commander's insides. His body convulsed, and then his hand fell limp inside Gideon's. The funeral was held at sunrise at the edge of the hedron, looking out over the land. The Zendikari sang hymns, their voices starting low and strong, and swelling into something tumultuous and daring. Gideon joined in when he could, but Tazri's sidelong glances confirmed that he was off-key. Commander Vorik's body was wrapped carefully in cloths, and the Zendikari at the camp formed a circle around their fallen leader. In turn, each of them knelt and, with a dark charcoal rock, drew a mark on the burial cloth, whispering a chanted message as they did. It came to be Gideon's turn. "You don't know what to say, so say nothing," Tazri hissed under her breath as he stepped up to Vorik's body. Gideon knelt. He picked up the dark charcoal rock and made the mark in silence. Tazri was right, he didn't know the words of the burial. But he did know what to say. He stood, inhaling a great lungful of Zendikari air and letting the scent of the wild land fill him. He looked out at the people of Sky Rock, his people. "Today we have lost much," he began. "More than just our commander. We are left without our leader, our champion, our guiding light. Like the lighthouse at Sea Gate, Commander-General Vorik stood tall and true even in the face of greatest adversity. And even though he is gone, we must do as he did, because we now face the greatest adversity Zendikar has ever known. "In the same way that the corruption spread to claim our friend's body, so too do the corrupting monsters spread across this land. Each day is worse. Each day there are more. Each day they take more. We cannot let them do this any longer." He nodded to Vorik's body. "We have seen what happens when they are allowed to rampage at will. We cannot let what happened to our leader happen to this world." He paused, looking around at the fallen, desperate faces. "We have a choice before us today. We can choose to leave Sky Rock. We will be ready to evacuate within the week. We have rations and supplies. Boats wait for us at the harbor. We can retreat to Zulaport." The people leaned in, anxious. "But if that's what we choose, many of us will not make it. The journey will be dangerous. We will encounter scores of Eldrazi across the land and in the waters. I have been across the sea. I have seen the Eldrazi at Ondu, Kabira, Fort Keff, and all places in between. They are everywhere. And every day there are more. They might already be at Zulaport. 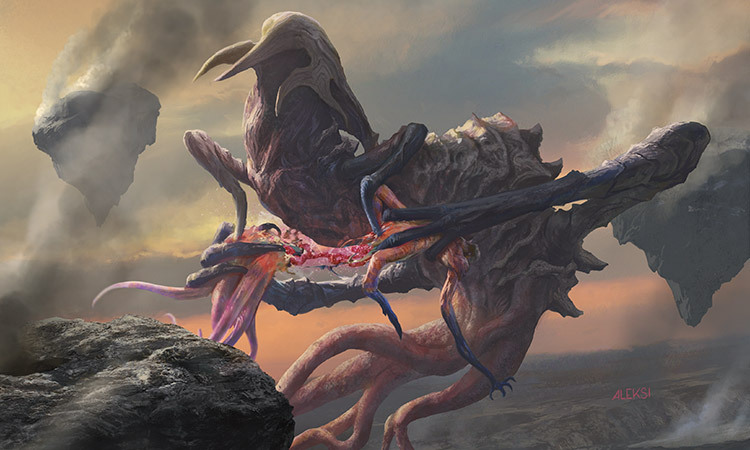 Those of us who do make it to Zulaport may find nothing but more Eldrazi." Tazri made to argue, but Gideon held up his hand and continued. "Or perhaps we will find that the safehold still stands. But if that is so, for how long? How long will anything stand?" He glanced at Tazri. "There is no saying, but at some point, if we choose Zulaport, Zulaport will fall. 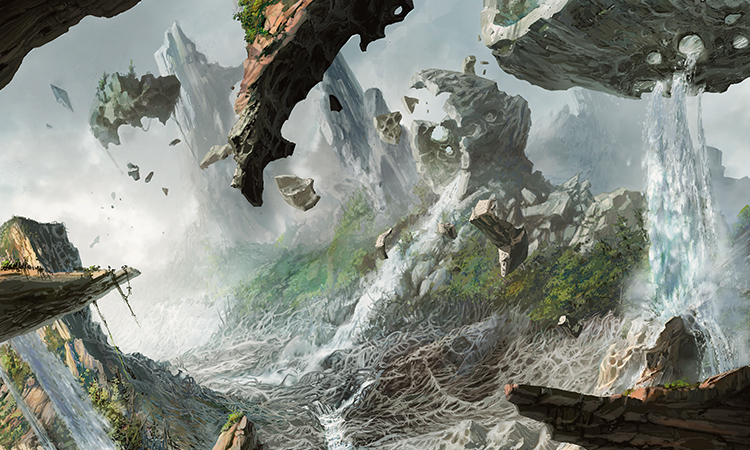 It will fall just as Sea Gate fell, just as every other part of Zendikar is falling. If we chose to retreat, we will be destroyed along with this world." It was a hard truth, but it was the truth, and these people deserved to know the truth. They had to know the truth. "But we do have another choice," Gideon went on. "We can choose to fight back. We can choose to stop running. We can choose to go on the offensive. To stand tall and true in the face of the greatest adversity. I stand before you today as your commander, and I ask you to choose to fight. I ask you to help me. Help me gather every Zendikari, from all corners of the world, from every continent, every last Zendikari who is willing to fight. We will assemble right here at Sky Rock. The full strength of Zendikar will converge in one place, and with that force we will fight. With the might of the world behind us, we cannot lose. We will use that power to reclaim Sea Gate." A murmur rose up from the gathered crowd, but Gideon continued. There was more they had to hear. More he had to say. "Sea Gate is the heart of this world. It is the most strategic location, filled with weapons, food, and supplies. Fortifiable, defensible. Reclaiming it is only the first step. From there, we launch our own attack. We become the predators. We hunt the invaders. We wipe out the corruptors. We spread across the land and take back what is ours." He whipped his sural through the air. "We take back Zendikar!" He looked at the gathered Zendikari in turn. "Who is with me?" After a long moment, Seble raised her fist. "For Zendikar!" "For Zendikar!" Abeena added her call. Cheers rose up from the gathered crowd with such a force that the voices shook the very hedron the people stood on. "For Zendikar!" Gideon looked to Tazri. She was standing at his side, her arms crossed. "I will not leave," Gideon vowed. "I am here to the end." "You have my word," he said. "I will battle for Zendikar." The halo around Tazri's neck glowed brightly, its light catching the wetness in her eyes. She nodded. 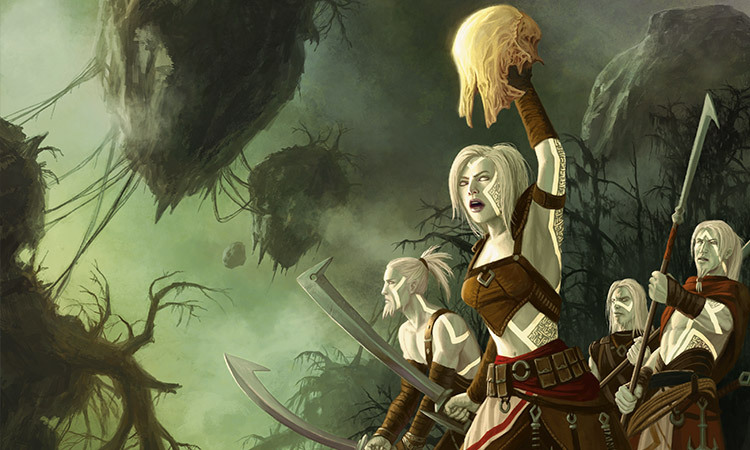 "For Zendikar, Commander, I will battle too."